I was recently asked to share my favourite scripture. I don't think I really have one specific scripture that I would choose, but on that occasion, the one that came to mind is from the Book of Mormon and the reference is 2 Nephi 2:25 which says, "Adam fell that men might be; and men are, that they might have joy." It's a short verse that I memorized in high school for Seminary (an early morning gospel study class that I would attend every morning before school). We memorized quite a few scripture references, but that one really stuck (because it was short and easy to remember ;). It also stuck because of the message. This life is full of challenges and difficult situations. I think it has to be that way. We learn and grow through those experiences and so much of who we are becoming is because of how we deal with the difficult things in our lives and what we manage to learn from them. So I find it comforting that although we are meant to go through "trials" in this life, we are also meant to have joy. I've written about happiness on the blog before- in terms of being happy "now" and not waiting for good things to happen in the future to make us happy. The same goes for waiting for material items to make us happy. 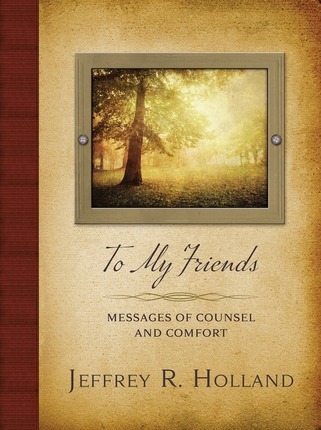 I have been reading a new book by Jeffrey R. Holland called To My Friends; Messages of Counsel and Comfort (published by Deseret Book). Chapter 18 is called: "To my friends who seek happiness". He quotes Aristotle as having said, "Happiness is the meaning and purpose of life, the whole aim and end of human existence." Then he focuses the rest of the chapter on how we can "pursue" happiness. He says that the best chance we have for being happy is to do the things that happy people do. Of course, he and I both believe that happiness and peace and joy are found by living the gospel of Jesus Christ and he does talk about that, but he talks about other things too. He quotes Abraham Lincoln as having said that, "folks are usually about as happy as they make up their minds to be." and Elder Holland says that, "happiness comes first by what comes into your head a long time before material blessings come into your hand." He also talks about how sometimes we just need to get to work and focus on something else, and then we will find that happiness will just come to us. However, he also points out that (in the words of Elizabeth Gilbert), "Happiness is the consequence of personal effort," and that we must, "participate relentlessly in the manifestations of [our] own blessings... keep swimming upward into... happiness." I feel like this all relates back to the idea I was expressing in my previous post about being happy now, and being happy where you are. Happiness doesn't come after waiting for an event or a possession to come to us. It comes from working. We have to work at it and we have to choose it. Another thing that he mentioned in that chapter that I thought was worth sharing was kind of a "what not to do". He touched on anger and how it is damaging to almost everything it comes into contact with. He talks about how important it is to avoid contention, anger, and animosity in our lives. I thought it was interesting that he talked about negative thoughts and how even speaking them can let the words take on a life of their own, but thoughts can die quickly if we don't speak them. I suppose that could be taken in different ways but I found it interesting after a conversation I had recently with my sister-in-law about negative thoughts and deciding when it is worth bringing them up (at the risk of hurting someone) and when it is worth talking about (in order to solve or deal with them). She shared with me something she had been trying- she would wait one day before talking about something that was bothering her (to see if it still felt as important to her in a day). I like that approach! So, what are your thoughts about this topic? Are there things you try to do to bring happiness into your life? Are there things you have found that help you to have more joy? The book I referred to also touches on many other topics and messages, such as, "to my friends who love the Lord," "to my friends who want to change," and "to my friends who face opposition." There are 21 such chapters. Each chapter begins with a photograph and a quote overlay from the chapter. I'm really enjoying this book- it's another one that would be a nice gift idea! Disclosure: I was provided a copy of the book mentioned above, for review purposes. All opinions shared are my own. I often say to my husband life is too short to be unhappy. I know with 3 kids under 5 things are chaos around here, but we need to embrace it right now, because our house will be empty again before we know it. It's so true- and really- kids grow SO FAST.. I know everyone says it, but it's so true! I can't believe my "baby" is 6! What an inspiring post! I agree with you that you need to embrace life now because it is too short and will disappear quickly. Thank you Jennifer! It's true, and it's so easy to get into that habit of thinking about the future and how "things will be better when..." or "life will be easier/happier when.." but that can lead to thinking (in the future), "I wish I would have enjoyed life more when.."... so we really just need to look for the good in our lives at this very moment and enjoy it! Great post! Thanks for sharing. 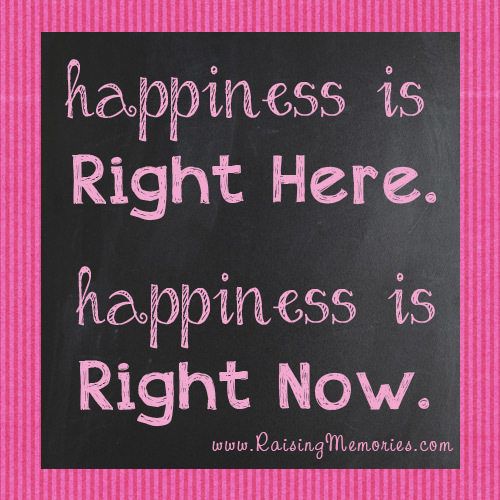 I totally agree that you need to be happy in the moment. Very motivational. I've been a little bit of a dark cloud lately, thank you for the reminders. I am going to work on this. You're very welcome! :) I'm glad it could help to lift your spirits! Thanks! Love reading your thoughts. I was thinking about this today of how is a balance between allowing happiness to just come into our lives and making an effort. It was nice to see that perhaps I was on the right track with that thought.